I found this recipe in O Magazine. Now, you know Ms. Oprah likes her treats. I like cinnamon rolls but they tend to be too dense and chewy for me. 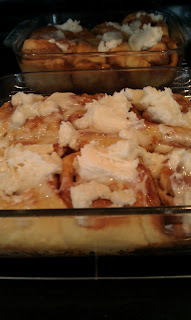 I was intrigued by a recipe that has vanilla pudding IN the dough. Well, I ate four of these on Christmas Eve. FOUR. 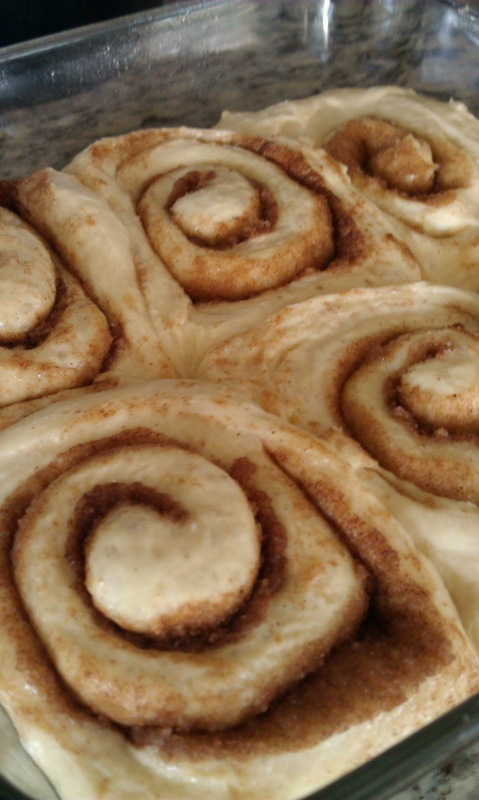 They are pillowy, light, decadent, and should be called SINNamon rolls. But I have made them about 4 times since and they are a huge hit to all the recipients. It is cold outside, you need something to do, don't you? And you already worked out this week, like I suggested, right? So get to work on these. From my kitchen to yours, enjoy every bite. PS: According to Oprah, this recipe makes 12 rolls. 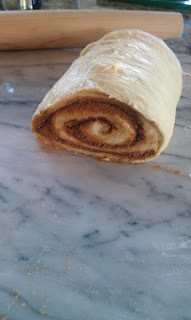 Ummm, I think you like the XXXXXL size cinnamon roll, Oprah, because this recipe made over 2 dozen. See the pics below, I baked some free standing and some in a pan. The pan version is my preference and I now cut this recipe in half to make 12. Enjoy! In a medium bowl, combine water, granulated sugar, and yeast; set aside until very foamy, about 10 minutes. Meanwhile, grease a large bowl with oil; set aside. In the bowl of a stand mixer fitted with a paddle attachment, beat prepared pudding, 8 Tbsp. melted and cooled butter, and eggs on medium speed until well combined. Add yeast mixture and beat again until combined. Add salt and then flour, 1 cup at a time, incorporating it first on low speed, and then working your way up to medium speed, mixing well after each addition. Turn dough out onto a floured surface, dust with flour, and knead to form a smooth ball, 1 to 2 minutes; transfer to prepared bowl. Cover with plastic wrap and refrigerate for 8 hours or overnight. Next steps: Grease a 9x9 pan for 6 rolls, or 13 x 9 for 12. Set aside. In a medium bowl, combine brown sugar and cinnamon. Transfer dough to a large, floured work surface and divide into 2 pieces. Roll out each piece into a 12- x 16-inch rectangle and spread 4 Tbsp. butter over each. Scatter cinnamon-sugar mixture evenly over dough, and then snugly roll up each rectangle, starting with the short side, to form 2 (12-inch) logs. Cut each log crosswise into 6 rolls and transfer to prepared baking sheet, spacing them evenly apart. Cover loosely with plastic wrap or a light kitchen towel and set aside in a warm spot until doubled in size, 1 to 2 hours. Preheat oven to 350°. Bake rolls until puffed and golden brown, about 30 minutes. Meanwhile, make frosting: In a large bowl, beat remaining 8 Tbsp. butter and cream cheese with an electric mixer on medium speed until well-combined and fluffy, about 2 minutes. Add powdered sugar, milk, and vanilla and beat again until creamy and combined, about 1 minute. 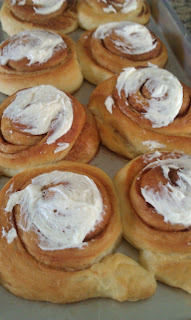 OR: You can easily find the copycat recipe for Cinnabon cinnamon roll icing which is what I used. OR: I also made a simple honey glaze for one batch: Tupelo honey, powdered sugar, milk to thin = amazing. While rolls are still hot, drop a large dollop of frosting over the middle of each one, spreading it out a bit with the back of a spoon. They are delicious warm or at room temp. Ohhhh heaven on a plate! I wish! I'm on the Dukan Diet and I can't even sniff this recipe, let alone eat it. You've made it FOUR times in less than THREE weeks? You are seriously addicted! I need to go buy some pudding mix ... tomorrow! Those look amazing! Typing this while watching golden globes and looking at Sophia and Selma, however is a deterrent to me trying this recipe. Tonight. Watch out for the zombie sluts. OH MY you had me at Vanilla Pudding Cinnamon Roll! Hello Lady!